Cosmo: Posit: People think a bank might be financially shaky. Martin Bishop: Consequence: People start to withdraw their money. Cosmo: Result: Pretty soon it is financially shaky. Martin Bishop: Conclusion: You can make banks fail. Cosmo: Bzzt. I’ve already done that. Maybe you’ve heard about a few? Think bigger. In a previous post I wrote about the nascent “Anon Analytics” group that had popped up claiming that they were going to out corruption in corporations by using OSINT and inside leaks/whistle-blowers. On the face of it, I thought this was a good idea and said as much in the post. I had caveats though that they confirm their information and that they be above board. I received a response from Anon Analytics thanking me for the article and that they had found it interesting. 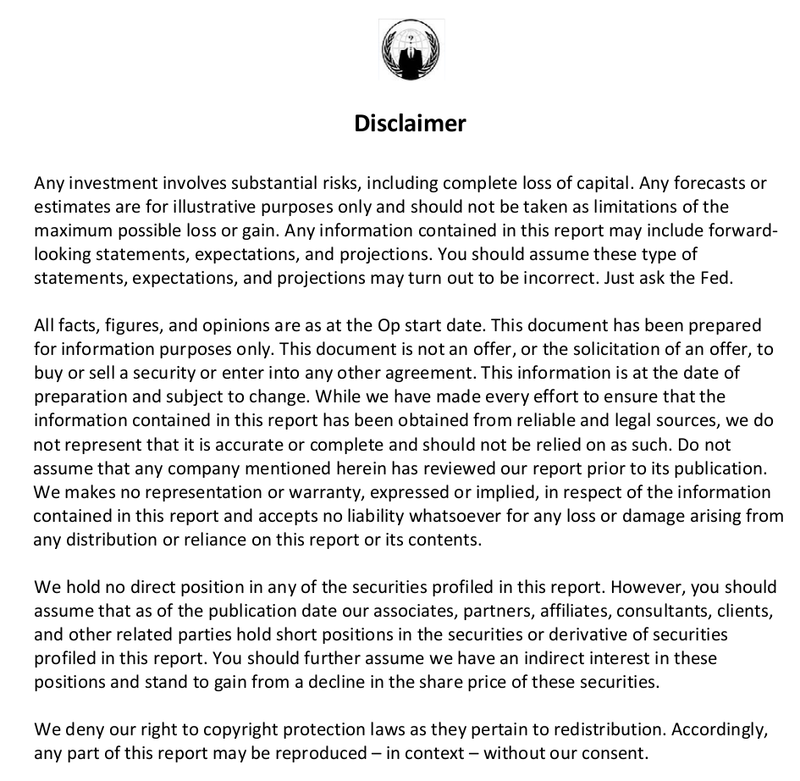 I however, had failed to read the disclaimer on the first report by Anon Analytics and as such, this is my mea culpa as well as another warning to Anon that they need to keep things above board here.. Lest they become just as bad as those who they are claiming they are outing for misdeeds. I was alerted to an article from Finance Asia that called them on the fact that within this disclaimer, they are making the statement that the assumption must be made that the “Partners, Affiliates, Consultants, Clients, and other related parties” hold “short” positions in the securities profiled in the report. Which means that all of the parties named there will profit from shorts due to the data being released and potentially causing the stock to plummet and fail. Say.. Isn’t that what got us all into this fix today with the markets and the banks in general? Yes, indeed, that is the case and this statement within their disclaimer alone causes me to pretty much rescind my previous statements about any kind of approval for these efforts by Anon Analytics. Really, this is the pot calling the kettle black and then throwing feces to boot. This is not how you rectify malfeasance! Frankly, this could just then be considered only a machination to make money off of the use of information warfare (disinformation as well) to profit and manipulate the markets. Look, what I said before about being above board with this effort still stands. If you want to right wrongs then you cannot use this effort as a potential piggy bank as well. At the present time, I cannot confirm all of your data from Chaoda however, if you look at the news following the reports release, you can see how you affected the market and the stock. The cause and effect may or may not have anything to do with your report in fact, but, time will tell if there are any real arrests in the whole affair concerning Chaoda. If there aren’t and nothing can be conclusively proven, then what has really been done to the company? Some losses yes, and, by your statement, those around you will profit.. Potentially. If you want to make a difference, you cannot be a party to profit from information warfare that you are generating.